BRAND NEW for Dodge RAM 09-13 1500 & 10-13 2500/3500 - RECON's Highly Anticipated Projector Headlights w New Cutting Edge CCFL Halos and Daytime Running Lights! 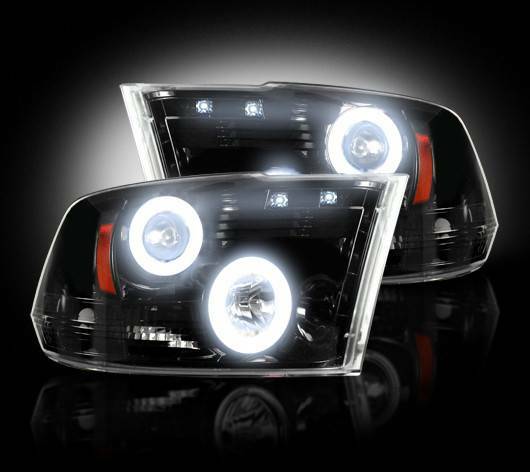 These Dodge RAM 09-13 1500 & 10-13 2500/3500 RECON Projector Headlights are sold as a set & use H1 Style Headlight Bulbs for the Projector Low-Beam and 9005 Style Headlight Bulbs for the High-Beam. These particular Dodge RAM 09-13 1500 & 10-13 2500/3500 RECON projector headlights ONLY come with basic halogen headlight bulbs pre-installed in the Low-Beam; however, if you wish to upgrade to HIDs or XENON Headlight Bulbs for your projector Low-Beams, then you must order 1 set of any of the the following part #'s: 264H1HID, 264H1DW, 264H1PB, or 264H1SY. We DO NOT pre-install the 9005 style High-Beam so you can either use your factory installed 9005 bulbs, or if you wish to also upgrade to HIDs or XENON Headlight Bulbs in the High-Beam portion of these new Dodge RAM 09-13 1500 & 10-13 2500/3500 Projector Headlights, then you must also order 1 set of the following part #'s: 2649005HID, 2649005DW, or 2649005PB.